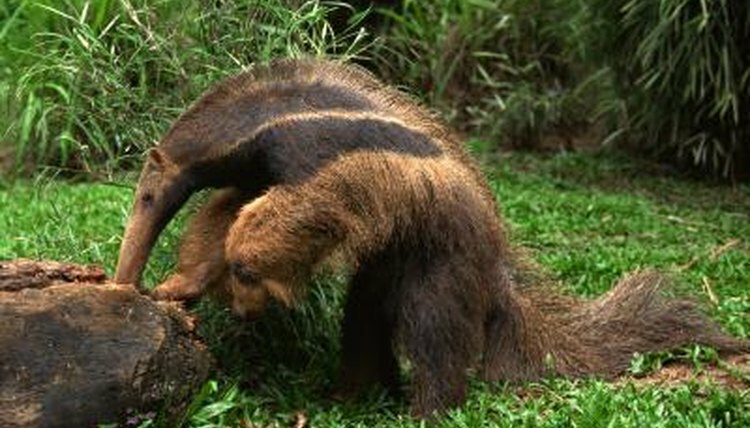 Anteaters are mammals notable for both their curiously extended snouts and their heavy insect diets, the latter clearly expressed by their name. When it comes to feeding, these toothless creatures rely on their sizable tongues. Anteaters, which reside in both South and Central America, exist in four distinct and separate living species. The giant anteater (Myrmecophaga tridactyla) is the biggest of the anteaters, according to the Smithsonian National Zoological Park. These brownish ant-and-termite eaters often weigh between 40 and 100 pounds, and are frequently anywhere from 5 to 7 feet in length. These solitary animals prefer to stay in grassland, rainforest, damp forest, woodland, savanna and swamp environments, and can manage successfully in both quiet and bustling settings. The northern tamandua (Tamandua mexicana) is a comparatively wee anteater that inhabits subtropical and tropical forest landscapes alike. Northern tamanduas also frequently live in cloud forests, dry savannas and mangrove swamps. For the most part these anteaters remain within trees. Northern tamanduas appear in two different color schemes—solid beige and beige and black. They usually weigh from 4 to 15 pounds, indicates Animal Diversity Web of the University of Michigan, with lengths of roughly 18 to 30 inches. The southern tamandua (Tamandua tetradactyla), which is also often referred to as the "collared anteater," is a pale yellowish animal with a dark vest. Southern tamanduas usually tip the scales at just under 10 pounds or so, with total lengths between 21 and 35 inches. They can adjust with ease to a wide array of habitat types, and usually live in damp rain forests, gallery forests and savannas. Southern tamanduas generally live close to bodies of water such as streams. The silky anteater (Cyclopes didactylus), which is also called the pygmy anteater, is the tiniest of all, according to the Edge of Existence Organization. These diminutive creatures usually are just over half a pound in weight, with lengths of a little over 7 inches. It is not common for silky anteaters to descend from trees. Ceiba trees are their preference. These yellowish-golden anteaters go about their business during the night hours, and usually live in mangrove and wet tropical lowland forest environments.